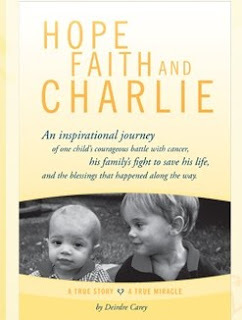 One of the books I read last month was Hope, Faith and Charlie: An inspirational journey of a child's courageous battle with cancer, his family's fight to save his life, and the blessings that happened along the way. The author, Dierdre Carey had contacted me and sent me a complimentary copy of the book to read. Her initial email brought tears to my eyes. Imagine having two young sons and so much hope for your growing family and then finding out that your baby has a huge brain tumor, a very rare form of cancer. As a mom, I know it was hard enough when my babies didn't feel good, but compared to the 21 months of chemotherapy and 11 operations Charlie had to go through, that was nothing. I agreed to read Deirdre's book, but then once it arrived I put it off for a while. I thought it would be hard to read, and in a way it was, because it's hard to see anyone go through what this family did. Once I actually sat down and started reading, I had a hard time putting it down. I fell in love with Charlie, which is pretty much the story of Charlie's life - everyone falls in love with him. I found myself crying, as I thought I would, but not necessarily in the places I expected. I found myself laughing out loud, cheering for Dierdre when she stood up to the nurses and doctors who needed put in their places, and marveling at the faith and love this family showed throughout the entire ordeal. Thankfully, miracles do still happen because Charlie made it through his battle with cancer, meeting many new people and changing lives along the way, and he's now 10 years old. With this book, Dierdre Carey hopes to renew people's faith and belief in miracles, and I think the book does just that. You can buy the book at hopefaithandcharlie.com or on Amazon.